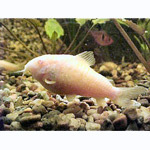 Like all Corydoras you should keep this species in a group with at least 6-8 fishes. The aquarium should be well-planted with many hiding places. The substrate should be fine sand because the fishes like to burrow for food in the substrate. They are omnivorous but they prefer live food as Tubifex. Dry food is accepted as well. Breeding is not very easy. Up to 100 eggs are laid and fertilized. After spawning the parents should be removed. The fry hatch after 3-10 days and when they are swimming free you can feed them with very fine infusoria and a few days later with baby brine shrimp. The Aeneus Corydoras is a schooling species that should be kept in groups of at least three to best observe their natural behaviors.